Next day delivery. Quality battery at competitive price. Very well packaged. 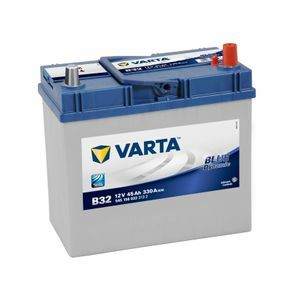 Not sure how this will last against the 'Yuasa' brand but I know from the past Varta is also a reliable brand. Bought for my MX5 mk3, 2008. It fits perfectly and after topping up the battery the car started right away. Definitely recommend Tanya to anyone, as the battery and charger I ordered arrived in just a day and as other reviewer found the items were well and safely packed. The Yodel delivery driver was very courteous and friendly too. Very happy customer. An excellent battery - exactly the right one for my MX5. However, I have now bought two batteries from Tayna and both have been delivered to the wrong address. Great service from this company except that delivery seems to be a problem. Great service from Tayna, competitive price. Easy job to swap the battery in a Micra K11 ready for cold mornings. Great service. My only comment is I'm not on facebook (don't wish to be) so not eligible for the 10% discount. Mm? Arrived bang on time, incredibly securely packaged, topped up charge and in it went. Second one bought from here, would buy again (but hopefully not too soon!). Tanya a well run company with a first class service. I ordered the battery when the car wouldn't start on Friday morning, paid the £1 supplement for Saturday delivery, which was duly honoured and I was mobile again by Saturday lunchtime. The courier (Yodel) provided clear info and tracking of the delivery. The battery was very well packed and sealed, with clear instructions to remove the transit plugs before use. I'm happy about that. The battery was an identical replacement for the previous one that I think lasted about 5 years, which I'm slightly disappointed with, but my usage pattern is perhaps not the most helpful for battery life, and the car seems pretty susceptible to low battery SOC. Excellent battery for mx-5 mk 3, this is a special small sized battery to fit the location on my mx-5. Mine is a jap spec car and I needed to change the battery terminals. A like for like replacement, supported by the usual impeccable service from Tayna! Many Thanks. Used in my Austin A35 to start a tuned 1098 A Series. Does the job well. 1st class service from Tayna and I've recommended to others .